I’ve always preferred bad wine to bad beer. (And good beer to good wine.) The pursuit of bad wine is how I first learned about Providence, RI- when living in Baltimore. I was just out of school juggling three jobs- none of which had anything to do with what I had studied. Now look- I could tell you that it was my need to satisfy my recently minted art history degree that drove me to every single art gallery opening in Baltimore. I could! But the truth is I was young and poor- I went for the free food and wine. At one reception I accidentally learned something though. It was a gallery showing of the senior projects of furniture design students from the Rhode Island School of Design. The curator distracted me from my initial mission with the gorgeous pieces, waxing about the very special school they came from, tucked away in the tiniest state, and I thought now THAT’s worth a trip. And I left it there in the back of my mind to ferment. 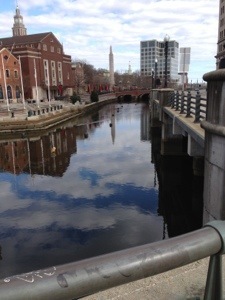 Over 20 years, 8 different state residences, a dozen or so jobs, and many shifted priorities later- I finally made it to Providence. For beer. It’s a hard place to plan a beer tour, frankly. Lots of destinations are closed on Sundays and many others don’t open until the evening. You have to actually do more than drink beer when you visit. Fortunately they have a quirky Culinary Museum at the local cookery school to distract you for a bit. 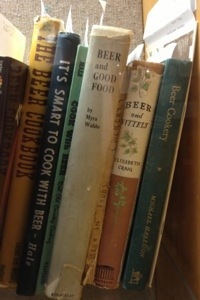 Check out the beer books! (above) Another nifty display features presidential inauguration dinner menus- every one of them starting with oysters. Who knew? 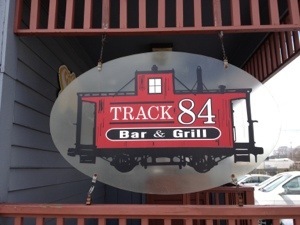 Track 84 opens at noon. I was waiting in my car outside. I first met Track 84’s owner Dave years ago at one of Shaun Hill’s legendary Memorial Day weekend camping sessions before Hill Farmstead was open. I’d heard great things and even sent people there without having tried it myself- always to rave reviews. Ageless Dave was laughing with his two little granddaughters when I walked in, and I felt right at home. 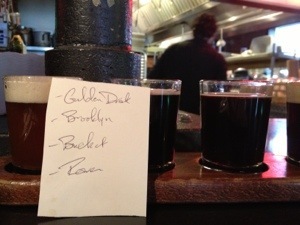 His bar keep let me sample the Rhode Island beers from Foolproof and Grey Sail. It was a tough way to start a long beer day, but I opted for Foolproof’s Revery- a sipping Russian imperial stout at 10.7%. Absolute velvet. The rest of my day had to be on foot, so I ditched the car at Dolce Villa (above), a wonderfully odd little hotel that could have been in Sleeper, and hit the sidewalk. Again having to schedule carefully, I hoped that Julian’s– arguably Providence’s best known beer stop- might still be open. They close between brunch and dinner- very Montreal! Where do people drink on weekend afternoons? I caught the tail end of brunch, unfortunately missing handsome owner/GM Brian Oakley who had given me several suggestions for my beer tour. The vibe was happy: loud music, bustling staff, plenty of chatty customers. At my perch overlooking the kitchen I had a super sampler that let me try several gems without teetering about. I lined up Gulden Draak’s 9000 quad, Thornbridge’s Raven, Brooklyn’s There Will Be Black, and local Bucket Brewery’s Park Loop Porter. My favorite find though was Foolproof’s canned Backyard IPA. I took a case home. Food is sometimes an afterthought at beer bars- but not here. Try to read this without dribbling: slow roasted lamb over ricotta polenta, grilled asparagus, chimichurri hollandaise. Oh my. 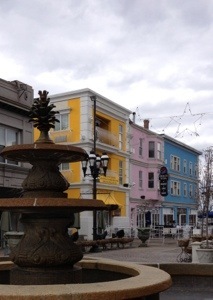 The groovy looking building above is a restaurant called New Rivers. My pursuit of offal is almost as obsessive as my hunt for craft beer, so I could not have been happier- truly giddy- than when I learned that the special was lamb balls. That’s right- testicles. See below. 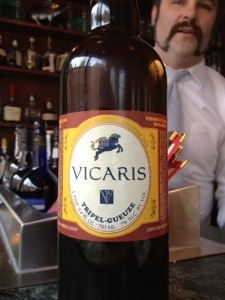 And the friendly man behind the bottle recommended this pairing, which was perfect with the lamb: Tripel-Gueuze. Afterwards I hit the Avery and finished my tour in grand form. 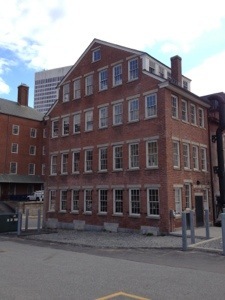 When you go, stop in Pawtucket first to check out Foolproof Brewery. I guarantee you’ll be hearing about them!